Do we remember the catastrophic consequences of the Hurricane Katrina throughout the United States of America in 2005? Or maybe the tornado outbreak in mid-May 2013, which produced several damaging tornadoes in a row in parts of Texas, Oklahoma, Louisiana, and Alabama. All of these devastating events are part of a climate change caused by global warming and regardless of the fact that we claim that they do not occur somewhere close to us, we are getting more and more affected. Our social responsibility is no longer limited to attitudes and behaviours in society; our environmental social responsibility is growing significantly and takes the lead in our daily routines and corporate cultures. Among important issues on the EU agenda, the hot Syrian question, another quite important ministerial meeting took place on May 15th 2013. In the far northern Swedish town of Kiruna, foreign ministers of the Arctic Council member countries met, putting an end to the Swedish Chairmanship of the Arctic Council (2011-2013). 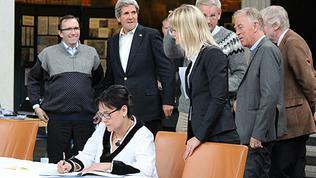 Sweden was represented by Carl Bildt, minister for foreign affairs, and Lena Ek, minister for the environment. The host, Carl Bildt, welcomed his counterparts, among whom were US Secretary of State John Kerry, Russia's Foreign Minister Sergey Lavrov, the Canadian Minister for the Arctic Council Leona Aglukkaq (who is of Inuk origin) and representatives from other Scandinavian countries, and outlined the main achievements of the Swedish Chairmanship, before handing over the gavel to Ms Leona Aglukkaq, thus marking the start of the Canadian Chairmanship over the Council for the next two years. During the meeting, more than 300 people – ministers, delegates from the eight Arctic states, representatives of indigenous peoples, scientists and observers - took part in the discussions and voted on declarations for the future of the Arctic cooperation and environmental issues. The Arctic Council has been established in 1996, following the Ottawa Declaration as “a high level intergovernmental forum to provide a means for promoting cooperation, coordination and interaction among the Arctic States, with the involvement of the Arctic Indigenous communities and other Arctic inhabitants on common Arctic issues, in particular issues of sustainable development and environmental protection in the Arctic”. The Arctic Council member states are Canada, Denmark (including Greenland and the Faroe Islands), Finland, Iceland, Norway, the Russian Federation, Sweden, and the United States of America. During the meeting, there were a few scientific working groups presenting reports on various environmental issues in the Arctic. Kiruna is a northern region of Sweden, situated on an area of 20,000 sq. km. with 23,000 inhabitants. Kiruna boasts Sweden’s highest mountain and the world’s largest underground iron ore mine. It is popular for its high-tech space research facilities and a successful tourism industry. The mining company LKAB, which began mining in 1900, is considered to be Kiruna’s largest employer. In a series of blog entries, Carl Bildt strongly underlined the growing importance of the Council, which presented its vision for future cooperation in the Arctic. "In its two years as Chair of the Arctic Council, Sweden has contributed to strengthening cooperation within the Arctic Council. At this meeting, we have adopted a vision statement for the future of the Arctic shared by the Arctic states and the Indigenous Peoples. This sends an important signal to the rest of the world", said the Swedish foreign minister after the meeting, quoted in a governmental press release. In his welcoming speech, Carl Bildt pointed out that global warming is happening twice as fast up north in the Arctic region than in the rest of the world. Therefore, he were pleased to witness that Arctic issues and the region had come more and more into global focus. “[…] we have managed to develop common guidelines for the prevention of possible oil emissions in the Arctic. Sweden has helped raise the profile of Arctic issues in international forums with a view to achieving more ambitious global emissions reductions”, added Bildt at the opening of the ministerial. In addition, he underlined the establishment of a secretariat in Tromsø, Norway, as well as clear guidelines for application of observer-states. During the ministerial meeting, decisions have been made on seven observer-applications - China, Italy, Japan, Korea, Singapore, India and the European Union. According to Carl Bildt, the interest shown by India and Singapore, is due to the increasing possibilities of shipping in the Arctic region because of climate warming. There are more candidate observer-states such as Turkey and Mongolia. A variety of scientific research was presented during the meeting with a strong focus on the preservation of biodiversity in the Arctic marine environment. Two main documents have been adopted in Kiruna: a statement on the 'Vision for the Arctic' outlining the Arctic states' and indigenous Permanent Participants' joint vision for the development of the region, and the Kiruna Declaration, which sets out the work of the Council during the Canadian Chairmanship (2013-2015). The Arctic programme during the Canadian Chairmanship will include the establishment of a Circumpolar Business Forum to provide new opportunities for business to engage with the Council; continued work on oil pollution prevention; and action to address short-lived climate pollutants such as black carbon and methane, according to the governmental press release. In addition, an important Agreement on Cooperation on Marine Oil Pollution has been signed by the foreign ministers in Kiruna. This significant agreement has become a sore issue in Sweden. The Swedish newspaper Svenska Dagbladet wrote that both political parties in Sweden - the Left party (Vänsterpartiet) and the Green Party (Miljöpartiet) - have expressed strong criticism over the Swedish Chairmanship. According to a press release by Green Party spokesperson Gustav Fridolin, “it is the largest environmental betrayal a Swedish government has committed for a very long time". According to him, Sweden should have tried to raise the issue of a ban on fossil fuel extraction in the Arctic and called the Chairmanship "a failure". The Group Leader of the Left Party, Hans Linde, went even farther in his criticism and called the Swedish Presidency “two lost years”. Also quite critical was Annie Reuterskiöld’s article for the Swedish newspaper Expressen. She recalls that when the "Deepwater Horizon" oil rig exploded in the Gulf of Mexico in 2010 it took three months to stop the flow of oil, although there had been developed infrastructure nearby and the water was warmer. If a similar accident occurred in Arctic waters, the conditions are hardly comparable. Arctic water is full of ice; the weather conditions are more severe - wind, fog, darkness. In addition, the lack of well developed infrastructure would complicate the assistance of handling such a possible eco crisis. According to Therese Jacobson from Greenpeace, there are huge problems that have not been taken into account during the adoption the Arctic Council agreement. There are no clear guidelines that entitle the information about which country should react first and who calls whom in order to trigger a solution of a problem. Other questions regarding knowledge and necessary expertise to prevent and deal with such possible accidents need to be addressed, too. Are there any security measures in place on the border between Russia and Norway where the Norwegian Statoil and the Russian Rosneft are about to start planning for oil drilling in 2020, the she asked. Oil is the natural resource that provides high revenues for those already rich countries. But the consequences of possible oil pollution might cause severe damage to our environment. What is happening in the Arctic flora and fauna is quite similar to the butterfly effect in the chaos theory: “a small change at one place in a deterministic nonlinear system can result in large differences to a later state”. Then, hurricanes, tornadoes, earthquakes will no longer be sporadic. It would be great to recall this next time when on April 22nd 2014 we express our support for environmental issues and the Earth Day. 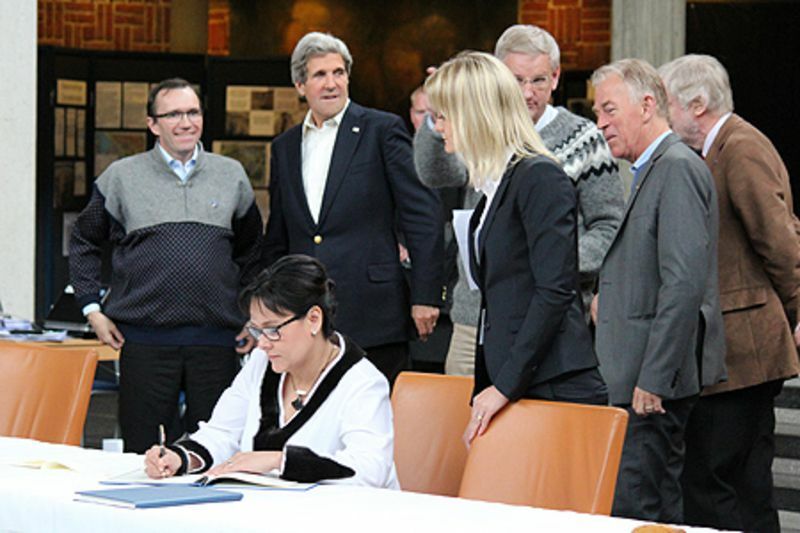 Nevertheless, there were three main benefits for Swedish politics from the ministerial meeting: the Swedish Chairmanship strengthened cooperation within the Arctic Council, the Swedish success during the Presidency in strengthening the role of the Arctic Council on the international field and the official visit of the US Secretary of State John Kerry. The visit of the US secretary of state to Sweden started the day before the meeting of the Arctic Council and is the second on in a year. The focus of the bilateral discussions between Kerry and Prime Minister Reinfeldt was on Afghanistan, Syria, Iran as well as the negotiations on a future free trade agreement between EU and USA. The Swedish prime minister noted that such an agreement would increase the trade flow by up to 30%. Mr Lavrov’s presence at the summit can be perceived as a serious political gesture toward positive diplomatic relations, but it is also a sign for the Russian oil interests in the Arctic region. In addition, the increasing positive image of the Arctic Council is undoubted, which by far is an outstanding political achievement for the Swedish foreign policy. But this is still a hollow victory - more courageous and decisive political policies are of crucial necessity; they should speak in their own language: not the language of oil money, but of the social environmental responsibility. It will be a tough Canadian Presidency, which needs to show its explicit commitment to Arctic biodiversity which, as it tends to happen, reflects the general climate change issues.